For whatever reason, you and your nanny part ways. Perhaps it didn’t work out or your kids are now in school so you don’t need a full-time caregiver. She now needs to find a new job and files for unemployment benefits to help during the transition period. But your state’s labor department has no record of your nanny holding a job. And why would they? You haven’t been paying unemployment insurance. A red flag is immediately raised and you can expect a call from your state with a hefty fine soon to follow. Any number of injuries or illnesses can happen on the job. Some can be serious enough to send your nanny to her doctor’s office or even the hospital. The doctor asks how she got hurt. In retelling her story, she says it happened while she was working. Now there’s a workers’ compensation claim. You live in one of the many states that require household employers to carry workers’ compensation insurance for their employees. Of course, the workers’ comp board in your state has no record of her even being employed because you haven’t paid your nanny legally. Again, expect to be contacted by your state and prepare to open your wallet. Workers’ compensation helps restore your nanny’s lost wages and cover some of her medical bills. Even in states where workers’ comp may not be required, it’s a good idea to have this protection. Nannies who take their jobs seriously likely won’t take your position if you plan to pay them under the table. They know the benefits of being paid on the books even if it means a little less in their paychecks each week. They have verifiable incomes and legal employment histories. They can receive unemployment, Social Security, and Medicare benefits. And now, the Affordable Care Act requires everyone to have health insurance or pay a fine. By being paid legally, your nanny may qualify for a subsidy when purchasing coverage through a health insurance marketplace. This is the type of nanny you want looking after your children. Your chances of having a long-term relationship with a “professional” nanny are much greater than with one where joining together in tax fraud is the beginning of your association. Let’s say you and your nanny decide to pay off the books. She’s enjoying the extra money in her paycheck and so far you haven’t had any issues. However, she starts to understand what she’s missing. She can’t get credit or apply for a loan as she has no work history. She realizes she’s not saving money toward retirement. She sees other nannies enjoying these benefits. Now she wants to be part of it. So she sues you for not following the law. There are a number of wage and labor laws and regulations that domestic employers need to follow. Some may be bundled into the New York Domestic Workers’ Bill of Rights. Others fall under the Fair Labor Standards Act (FLSA), Department of Labor rules, or IRS designations. These rules designate how to classify an employee for tax purposes, pay your employee including for overtime hours, properly track hours, provide time off, pay a minimum wage, and more. Not following the law will get you in trouble with your state and possibly the federal government. They won’t hesitate imposing a fine or penalty for your missteps. Getting caught paying your nanny “under the table” in any of the above scenarios could also trigger an IRS audit. Now the government is looking through your tax returns to see what else you may up to. If you haven’t done anything else wrong, the audit could just be a hassle. But you still may need to pay back taxes or a fine for not legally paying your nanny. According to The Motley Fool, failing to pay employment taxes can cost on average $25,000 in penalties and interest. Take the time to do it right. Or, even better, have someone do it for you and save yourself the trouble. You will have peace of mind and may be able to take advantage of tax savings through the Child and Dependent Care Tax Credit and your employer’s Flexible Spending Account. When the Department of Labor’s Home Care Final Rule was approved last year, Fair Labor and Standards Act (FLSA) protections were extended to most home care workers in the United States. That meant household employers needed to start complying with the FLSA’s requirements; therefore, an employer must determine what time constitutes “hours worked.” In some cases, the time a domestic employee spends sleeping at their workplace (the home) can be unpaid, even if the employee is required to be there, leading to the exclusion of sleep time hours for domestic workers. The Home Care Final Rule did not change any of the requirements regarding sleep time. Depending on the type of domestic employee (a “live-in” employee, those working a 24 hour shift or more, or those working a less than 24 hour shift), the rules for excluding sleep time hours vary. For employees to whom the exclusion rules do apply, if sleep time is interrupted because of work duties, they employee must be paid, and if interruptions prevent the employee from getting a total of at least five hours of sleep, they are entitled to be paid for the entire night. 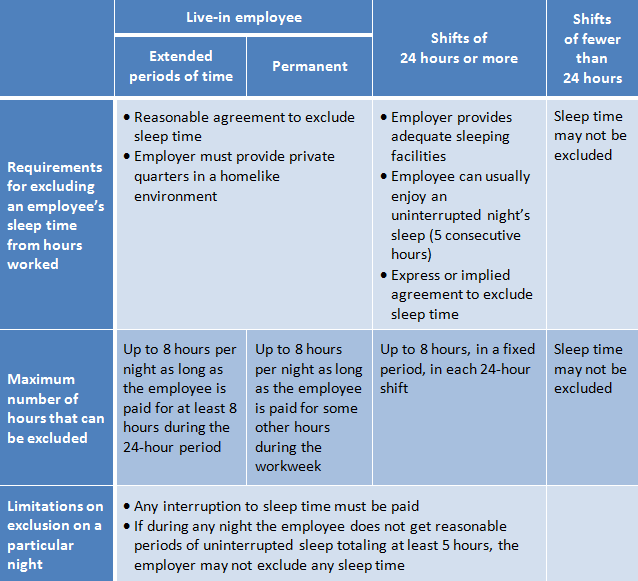 To help explain the sleep exclusion rules and how they apply, the Department of Labor has provided this handy chart below (click to enlarge). For more information about excluding sleep hours, please see this section of the DOL’s website, or contact us at (518) 348-0400. Earlier this month, Governor Cuomo announced the New York Paid Family Leave law, which is the nation’s longest and most comprehensive. This law impacts all private employers and employees in New York, regardless of size – including household employers and nannies. How much does it cost employers and employees? The family leave program will be funded by a payroll deduction of between 45₵ and $1 per week from each employee’s paycheck. It will become part of the deduction for New York State’s Temporary Disability Insurance, and it will not require a contribution from employers. When will it take effect and how much are the benefits? The paid family leave will be phased-in over a number of years. Beginning in 2018, paid leave benefits will be set at 50 percent of an employee’s average weekly wage and capped at 50 percent of the statewide average weekly wage. When fully implemented in 2021, the benefits will be set at 67 percent of an employee’s average weekly wage and capped at 67 percent of the statewide average weekly wage. When the plan is fully phased-in, employees who have worked for an employer for six consecutive months will be eligible for up to 12 weeks of paid family leave. Part-time employees become eligible on the 175th day of employment. Leading up to the full phase-in, employees will be eligible for 8 weeks in 2018, 10 weeks in 2019 and 2020, and 12 weeks starting in 2021. The leave is protected, meaning employees must be returned to their same job or a comparable position, with the same benefits, pay, and other terms and conditions of employment. Employees may use this time to care for and bond with newborns or newly adopted children or foster children, to take care of themselves or a family member with a serious health condition, or to address certain legal, financial, and childcare issues that arise when a spouse is called to active military service. Please note: this is not the same as the Family Medical Leave Act (FMLA). The FMLA is unpaid leave and only applies to employers with at least 50 employees. Over the past six years, we have seen states and cities enacting labor laws to protect domestic workers’ rights. These workers include nannies, housekeepers, drivers, personal assistants, and more. protected against harassment under the New York State Human Rights Law. obtain workers’ compensation insurance (to cover work-related injury or sickness) for an employee working at least 40 hours per week, and disability benefits (for when an employee cannot work because of injury or sickness (including pregnancy) from an event occurring outside work). California, Connecticut, Hawaii, Massachusetts, and Oregon now have similar Domestic Workers’ Bill of Rights laws, and other states, including Illinois, Ohio, and Texas, are working to offer comparable protections. Why did these laws come about? domestic work, though conducted in private homes, contributes substantially to the public good. Household labor is a linchpin connecting the economics of the home and the workplace. Household employers should be aware and well-informed of the more often-used leave laws like sick leave or Family Medical Leave, but other leave laws will arise. Employers are typically mandated to provide time off for civic duties like voting, witness leave, and jury duty, but state laws specify how much time can be allowed, payment requirements, and how much notice needs to be provided. Almost every state prohibits employees from being terminating or disciplined for serving on a jury or missing work for jury duty. Some states even make it illegal for employers to discourage or intimidate an employee from serving on a jury. Many nannies may wonder if they will be paid while reporting for and/or serving on a jury. In New York, employers are not required to pay an employee’s full daily wage while the employee is reporting to serve as a juror. The State will pay the $40 jury fee of jurors who work for employers of 10 or fewer employees if the jurors are not paid at least the jury fee by their employers. After three days, the State pays the jury fee to jurors who are not paid at least the jury fee. For jurors who are paid a daily wage that is less than the jury fee, the State makes up the difference. Note: Witness leave laws are generally the same as jury duty laws. As with jury duty leave, most states prohibit employers from taking actions like disciplining or firing an employee who takes time off work to vote. Some states require employers to allow a certain number of hours of time off so an employee can vote. And some states also require payment to employees for voting leave. In New York, employees who do not have four consecutive non-working hours between the polls opening and closing, or who do not have “sufficient” non-working time to vote, are entitled to receive up to two hours paid leave to vote. For example, if your nanny does not have at least a 4-hour break during the time polls are open (usually from 7am-8pm), or cannot make it to the polls before or after their shift, then you must provide up to two hours of paid time off so they can vote. So if your nanny works from 8am-6pm on an election day, as long as they can vote either before or after their shift, you are not required to pay for voting leave. But if circumstances prevent the nanny from voting before 8am or after 6pm, then you must allow up to two hours of paid time off during their shift so they can vote. When a nanny will not be able to vote before or after their shift, they must submit their request for time off between two and ten days before Election Day. The employer may decide whether the leave is to be taken at the beginning or end of an employee’s shift. Household employers should outline their jury duty and voting leave policies in the employee handbook; the policies should specify if the employer will compensate their nanny or other employee for jury duty, and what arrangements should be made with regard to time off for voting. While it may be tempting to pay your nanny or other household employee “off the books,” the benefits of being compliant with tax and labor laws far outweigh the risks of not following the law. Plus you’ll have peace of mind knowing you are adhering to your requirements as an employer. And you aren’t the only one that benefits from paying your nanny legally – your nanny benefits too! A sexual harassment policy stipulates that no nanny or other employee should be subject to unwelcome verbal or physical conduct that is sexual in nature or that shows hostility to the employee because of his or her gender. Sexual harassment can have devastating effects on the workplace. Therefore, household employers need to take every step necessary to prohibit sexual harassment from occurring. Many workplaces have a zero tolerance policy, which means an employer will not tolerate any sexual harassment whatsoever. everyone within the household is expected to act respectfully in order to enjoy a positive working environment. Employers must be prepared to respond to sexual harassment in the workplace—just as they are responsible for preventing any harassment or discrimination within the workplace. The employee handbook should include what is prohibited behavior in the workplace and what actions will be taken when a sexual harassment complaint is filed. In addition, the policy must state that, per federal law, no employee will experience retaliation for submitting a sexual harassment complaint. The line between home and work, domestic and business, personal and professional, has been blurry for a long time. Unfortunately, sometimes it becomes more than a story of cheating and closed-door liaisons and becomes much more serious. As a result, domestic workers (especially undocumented illegal immigrants) are frequently exposed to verbal and physical abuse, do not know their legal rights or the recourse to any legal protections, and are afraid of losing their jobs if they complain about any harassment or seek legal action. Many household employees are excluded from Title VII of the Civil Rights Act, which bans sexual harassment in the workplace. But in New York, the Domestic Workers’ Bill of Rights stipulates that it is an unlawful discriminatory practice for any domestic employer to engage in unwelcome sexual advances, request for sexual favors, or other verbal or physical contact of a sexual nature to any domestic worker. Review the federal guidelines on sexual harassment in the workplace, and contact us at (518) 348-0400 for more information.